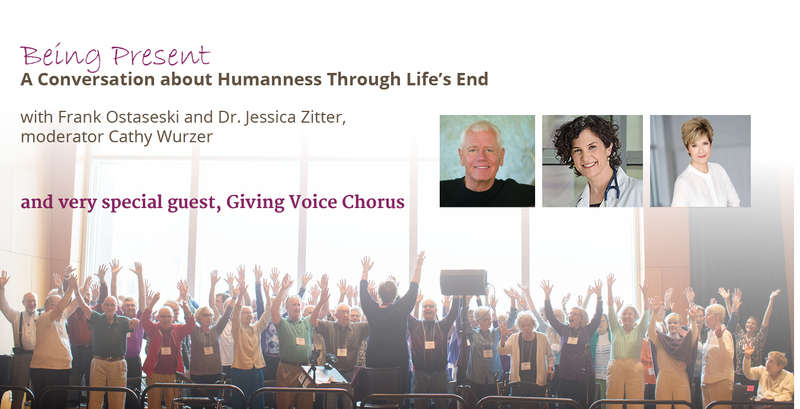 Dr. Jessica Zitter and Frank Ostaseski have both learned much from being present with the dying. Both Frank and Jessica feel a call to action to engage in conversations about the end of life, to bring humanity back into the health care system, and to be open to how thinking and talking about death can shed light on how to live. Join MNHPC, along with guest moderator Cathy Wurzer, for a very special evening that will inspire, engage, and challenge. The evening will begin with special guest, Giving Voice, a chorus that brings together people with Alzheimer’s or another dementia and their care partners to share music and foster joy, well-being, purpose, and community understanding. We know this will be an evening not to be missed. We hope that you will join us. Frank Ostaseski is a Buddhist teacher and leader in the field of end-of-life care. In 1987, he co-founded the Zen Hospice Project, the first Buddhist hospice in America. He guided that groundbreaking work for almost 20 years, establishing a longstanding model for mindful and compassionate care. In 2005, he founded the Metta Institute, training countless healthcare clinicians and caregivers and building a national network of educators, advocates and guides for those facing life-threatening illness. He is the author of The Five Invitations: Discovering What Death Can Teach Us about Living Fully. Dr. Jessica Nutik Zitter, MD, MPH, is a national advocate for transforming the way people die in America. She is Harvard and UCSF-trained to practice the unusual combination of Critical and Palliative Care medicine. She works as an Attending Physician at a public hospital in Oakland, California. Dr. Zitter is the author of Extreme Measures: Finding a Better Path to the End of Life. She is also featured in the Academy and Emmy-nominated short documentary “Extremis” available on Netflix. Cathy Wurzer is the host of Morning Edition for MPR News. She is also the co-host of Almanac, a weekly public affairs program produced by Twin Cities Public Television. She co-authored the book “We Know How This Ends: Living while Dying” and established End in Mind, an organization with the mission of igniting transformative conversations in communities about intentional and purposeful living now and through the end of life. Giving Voice Chorus was founded in 2014 by Marge Ostroushko and Mary Lenard as a way to add joy, community, and humanity to the lives of people living with Alzheimer’s or another dementia and their caregivers. The Twin Cities are home to three choruses with over 170 participants who come together for weekly rehearsals and fellowship. The Giving Voice Movement has gone international—with choruses in over 13 states and four countries. Our gratitude to the sponsors of the April 15th event--Thank you!